Satellite television provider DirecTV looks set to offer a standalone subscription to its popular NFL Sunday Ticket package for the first time, meaning cord-cutting football fans can follow the action this fall on their iPhone, iPad, or Mac without mounting a dish to their roof. 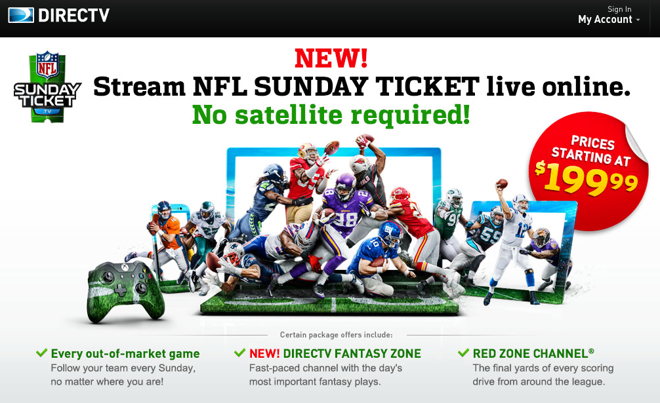 No official announcement has been made, but a promotional page for the new offering has appeared at NFLSundayTicket.tv. The company says viewing will be limited to out-of-market games when it begins on Sept. 7, but the popular Red Zone channel is included. AppleInsider was first tipped to the page by reader Sean. "Now you can access live, out-of-market NFL games without a DIRECTV satellite TV account--no matter what team you follow," the site reads. "NFLSUNDAYTICKET.TV lets you stream games on your computer, tablet, phone, or game console. All while keeping up with real-time player stats and your fantasy teams." A $199.99 subscription will grant access via Sunday Ticket apps on mobile devices and personal computers, while access on gaming consoles will require a $239.99 subscription. 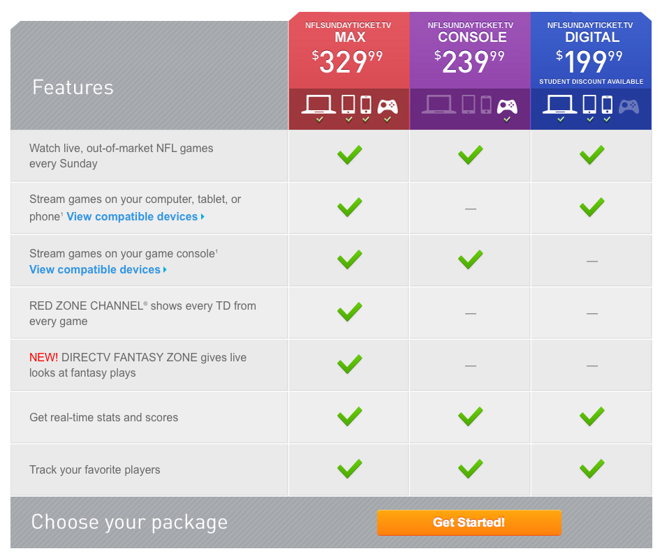 The most expensive tier, at $329.99, combines the two and adds access to Red Zone and the new Fantasy Zone channel. There is no word yet on whether subscribers will be able to use Apple's AirPlay technology to stream games on their television from an iOS device. Current versions of the Sunday Ticket app are not AirPlay-enabled, but it is possible that the new subscription packages will change that. The ability to subscribe to NFL Sunday Ticket without a corresponding DirecTV subscription is a major victory for would-be cord cutters, who often cite live sporting events as the number one reason for keeping an active television subscription. A similar package was previously available only to consumers who could not be connected to DirecTV because of coverage issues, though the company did trial a more wide-open subscription model last year in a partnership with the Madden NFL franchise.